My husband Kevin (49) and I, Maria (48) met in 2004. At the time, Kevin was lorry driving but then set up as a sole trader doing ground works. Later we set up a company with a partner doing road maintenance for Kent County Council but eventually sold our share. We now have a haulage company and are hoping to expand in the future. Kevin has 3 children and I have 2. My son lives at home but works full time and is our youngest at 18. I have enjoyed care work for many years starting at 17 when I became a personal carer for a lovely elderly couple with Parkinson's disease. I moved on to caring for EMI patients and also worked in nursing and residential homes. It was whilst working in a home supporting adults with learning disabilities and additional social and health care needs that I had the pleasure of meeting Suzy. Suzy (52) has a learning disability and is a real pleasure to know. 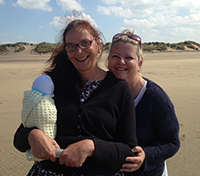 When the home was to be closed I applied to become a Shared Lives Host for Suzy because I felt I and my family could offer Suzy the right kind of support to help her have quality of life and achieve a more active social life. Suzy has done so much since living in our care and has enjoyed a holiday and a variety of activities and experiences. Our children, Kevin and I treat Suzy as family and she joins in with everything we do. Suzy loved a sports and Bushtucker trial event we hosted for family and friends which was enjoyed by all. Suzy is gaining confidence and enjoys new challenges and meeting new people. Time spent together is happy for us all. I love being a Shared Lives Host, I find it so rewarding and it is lovely to offer Suzy so many more opportunities. Walking our dogs, meals out and meeting friends, some being other adults Suzy shared her previous home with, always brings smiles and happiness. I feel I am very fortunate to have had the opportunity to become a host. although it can be a life changing decision, words cannot express the happiness we feel in making make Suzy's life special, safe and secure and giving opportunities that she may not have had the chance to experience in a residential home. There are so many positive things, too many to list but I know how excited we all are in looking forward to our first Christmas together. I wish all new hosts all the best and may I praise the Shared Lives team for all the support they give to help the host and adult to settle into their new life. Find out how Shared Lives has helped Douglas.